Did you catch my post from the DEMO house earlier this week? Perhaps it’s Sasha’s feathery friend with the piercing eyes, but these images scream Hitchcock to me. Have a spooky vintage Halloween! I can never say enough good things about my friends at A Vintage Affair. If you’re in need of some great threads for a Halloween party, then AVA is your place. Take this jumpsuit from the late 1960’s for instance. Bonnie from AVA tells us “the late 1960s were a time of bright & vibrant, psychedelic fashion. This jumpsuit is a great example of the hip & young look so popular then”. 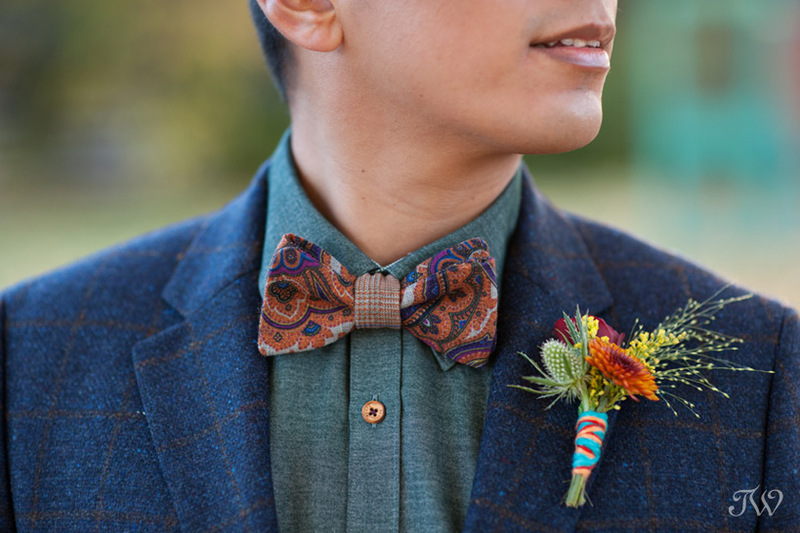 Here’s more from this photo shoot with A Vintage Affair, if you’d like to see. 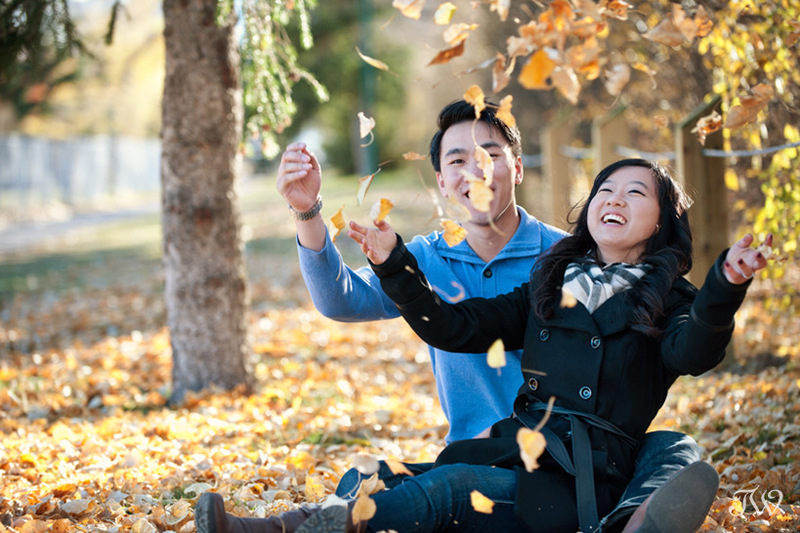 One of the best parts of being a Calgary engagement photographer is meeting up with happy couples like Al and Angie. We had to hunt a little but we found some remnants of fall and took full advantage of the season. 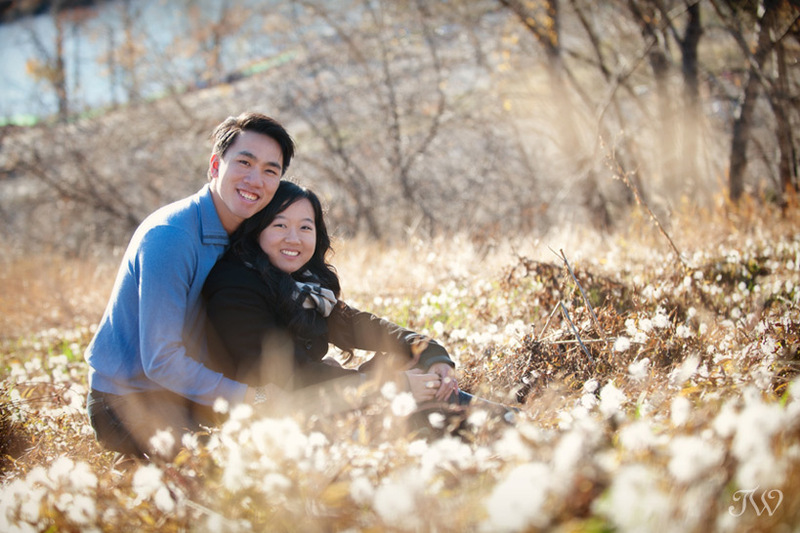 Here’s a sneak peek from their engagement session on the weekend. 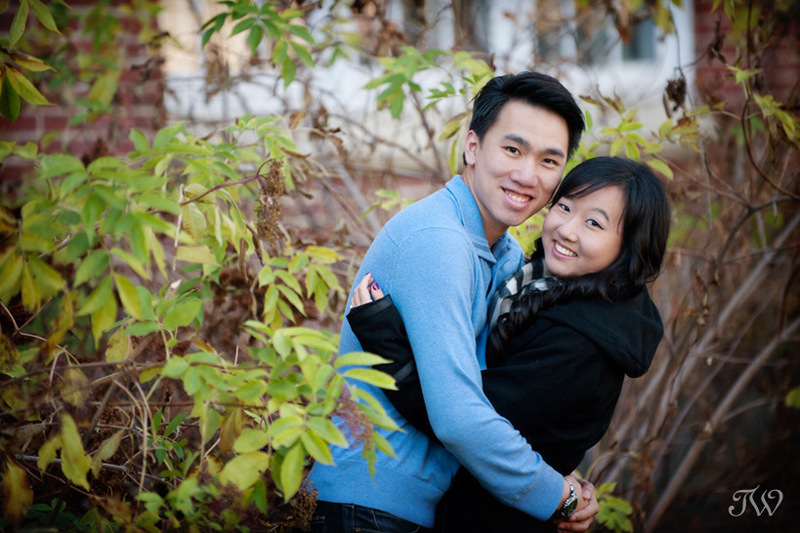 I’m looking forward to their nuptials at The Wedding Pavillion next year. Winter is right around the corner. 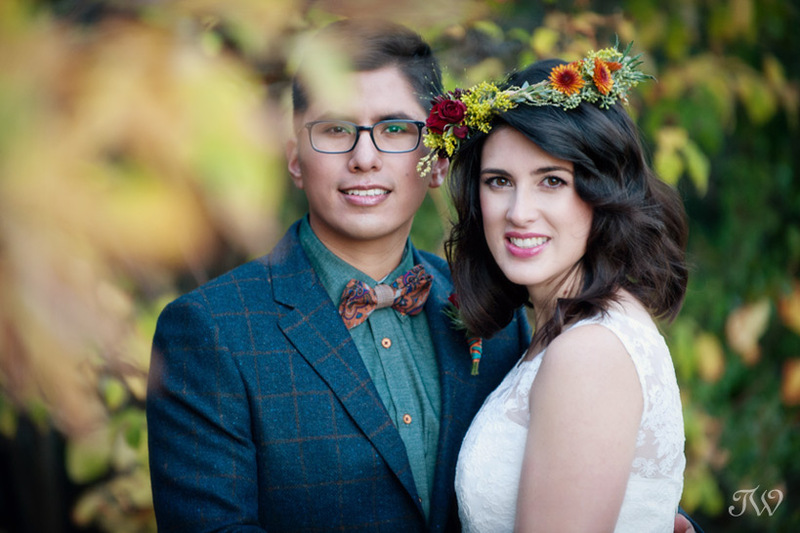 Here’s a snowy engagement session with pops of bright colour, if you’d like to see. Back in September, I had the opportunity to photograph Sasha from A Vintage Affair in a most unique setting, DEMO: Burdick House. It was a house on the verge of demolition, filled with sets designed for photographing, by Bart Habermiller & Emily Barnett. We started our shoot in the “white Garden of Eden”. Here’s what A Vintage Affair had to say about Sasha’s all-white attire. This 1940s liquid satin dress has a flattering bow detailed sweetheart neckline & lace enhanced bodice. For winter weddings, we love a fur stole – this one is blonde mink and very luxurious! 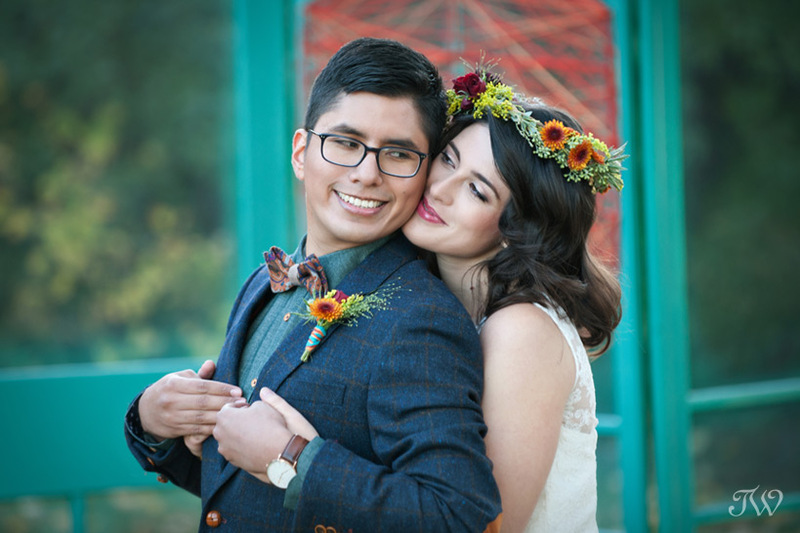 We have added a modern rhinestone belt and headpiece made exclusively for A Vintage Affair to give today’s bride a truly unique look. 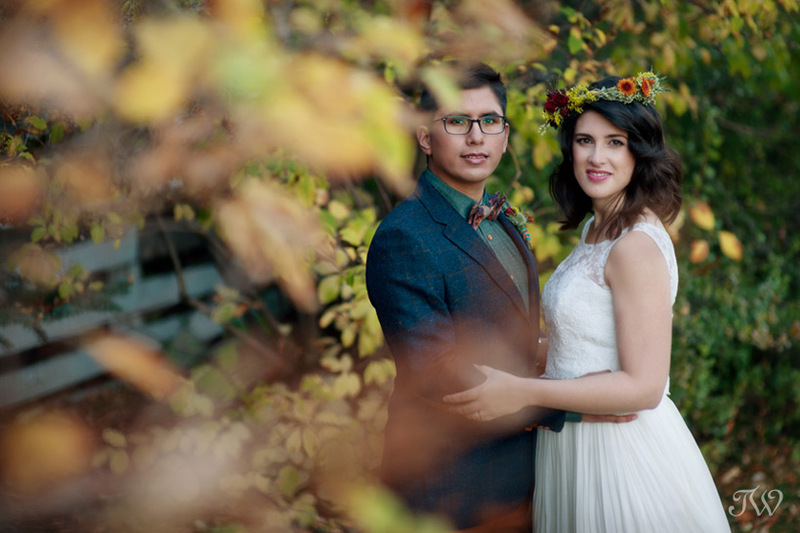 I loved how Emily and Bart created such a beautiful (if not Hitchcock-like) setting using broken poplars following the September snowstorm. Sasha embodied classic 1940s elegance with a definite Film Noir inspiration. Her gorgeous skirt suit was paired with a vintage-style veiled hat and a multi-pelt fur stole. As a wedding photographer, I always have my favourite images but it’s interesting to see what brides like. Today I’m featuring a little Pinterest round-up of this week’s most pinned photographs. 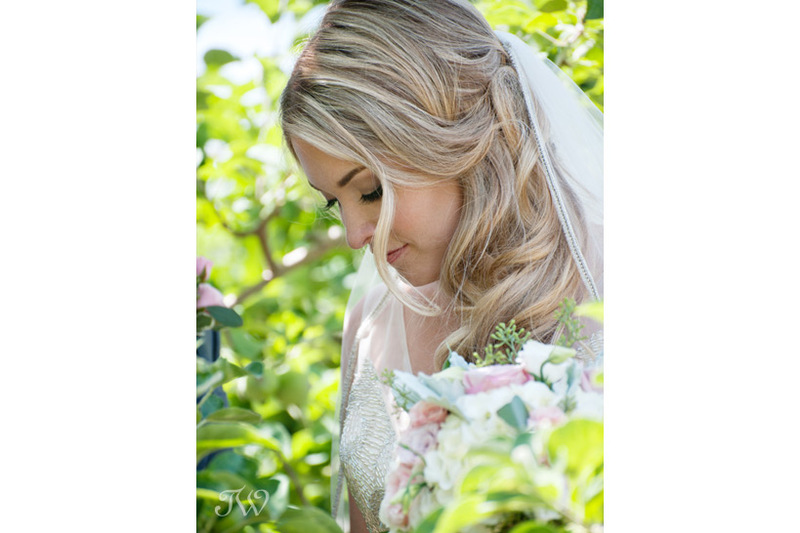 The most-pinned image is of gorgeous bride Kari at her Kelowna orchard wedding (recently featured on Style Me Pretty). Apparently brides can’t get enough of Kari & Derek’s nuptials. 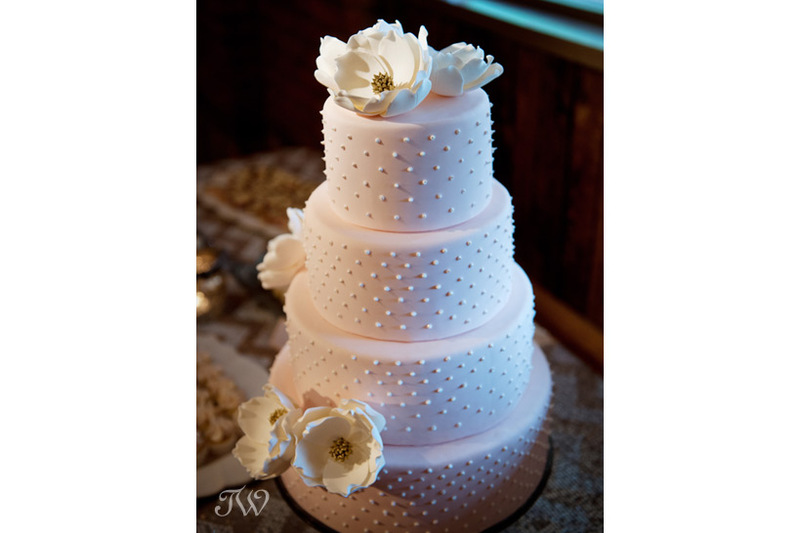 This is their gorgeous wedding cake by Bri Sikkes, Paul’s Bakery in Smithers, BC…. 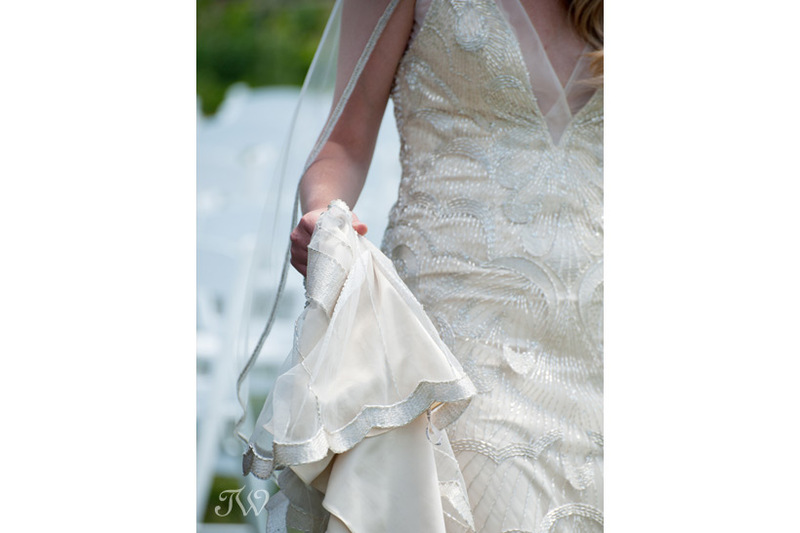 and a close-up of Kari’s Maggie Sottero beaded gown. 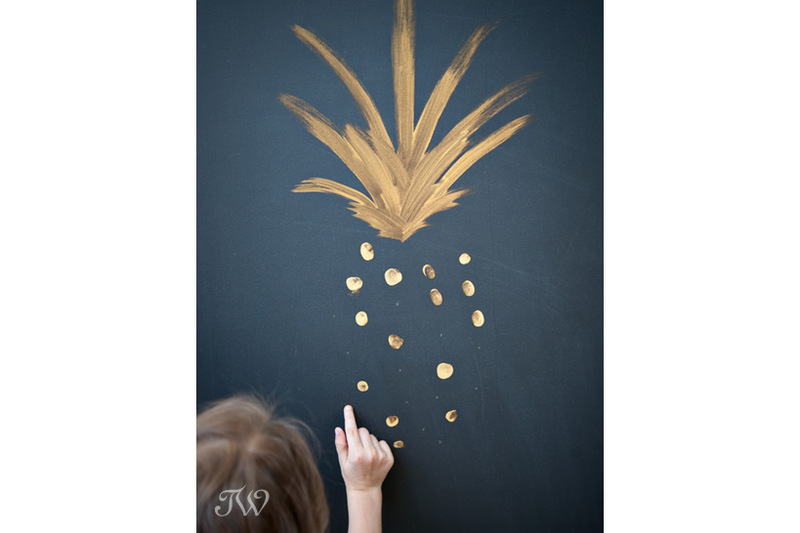 This image is from a pineapple-themed kid’s lounge. Here’s the full post featuring ideas for entertaining young guests at weddings, if you’d like to see. 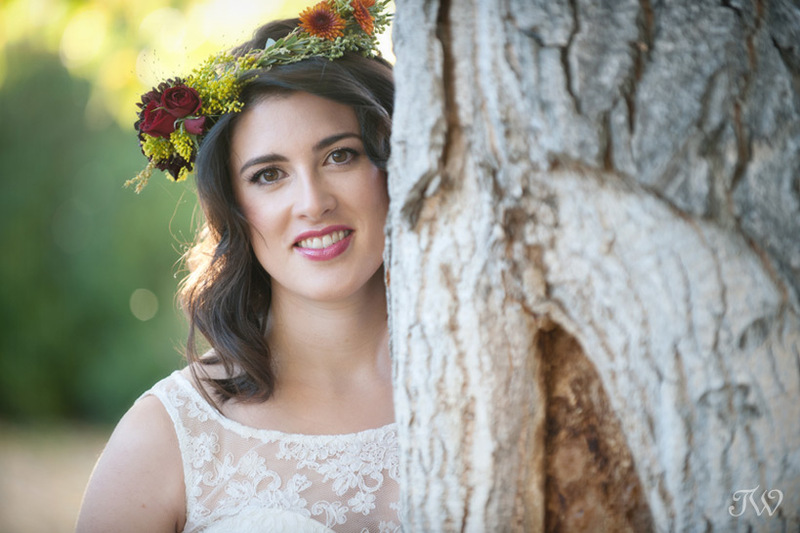 I’m not surprised that brides loved this shot of ultra-chic bride Krista, at her Contemporary Calgary wedding last year. 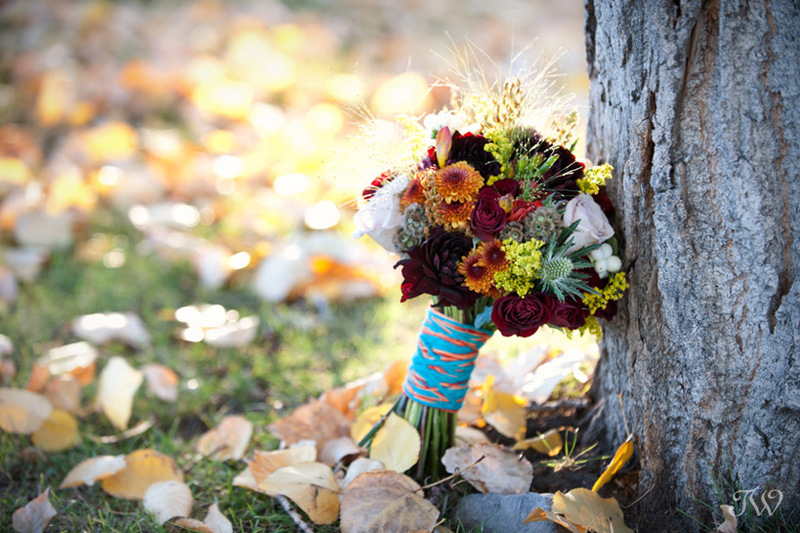 Her gorgeous fall bouquet was from Fleurish Flower Shop. There’s a yarn boutique in Inglewood called Stash and every time I walk by, I admire the yarn-bombed cruiser they have parked out front. 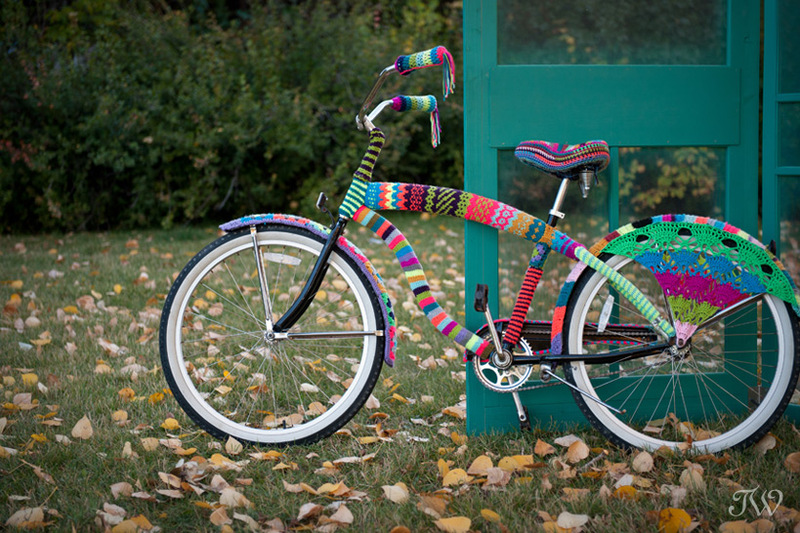 I always thought it would make the greatest getaway vehicle for a bride and groom and it got me thinking about other ways yarn could be used in wedding décor. 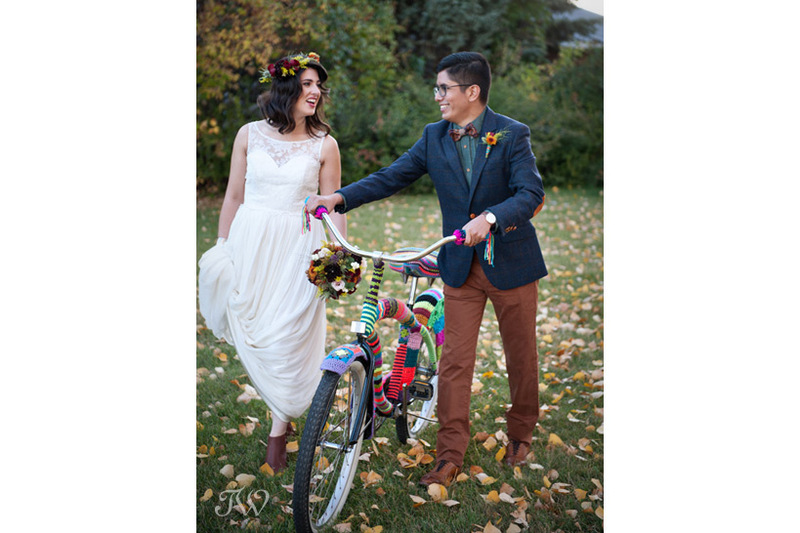 In addition to the bike, this shoot featured 3 ways yarn could be incorporated into a wedding ceremony. 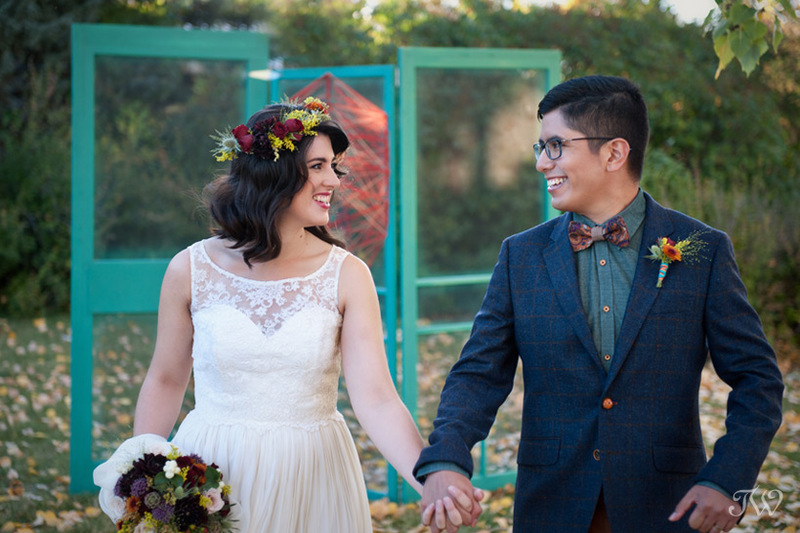 Real couple, Janie and Oscar, were happy to come along for the ride (so to speak). 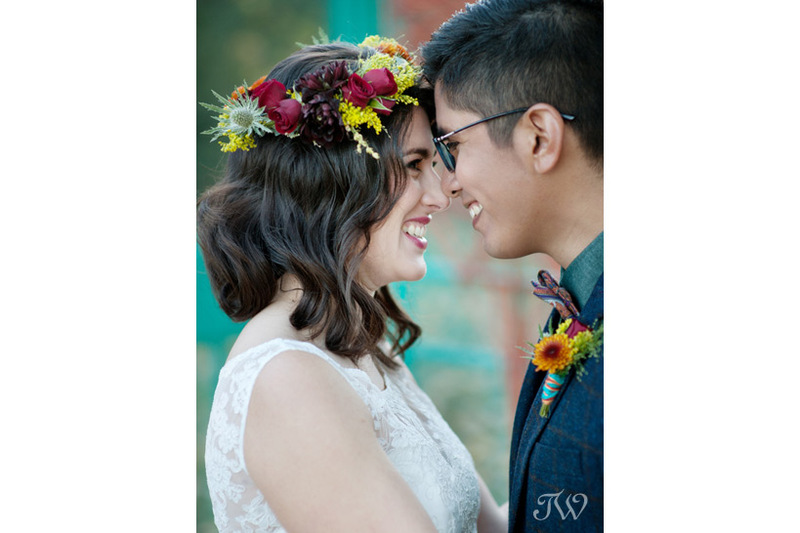 Turns out our bride was Janie from Flowers by Janie. 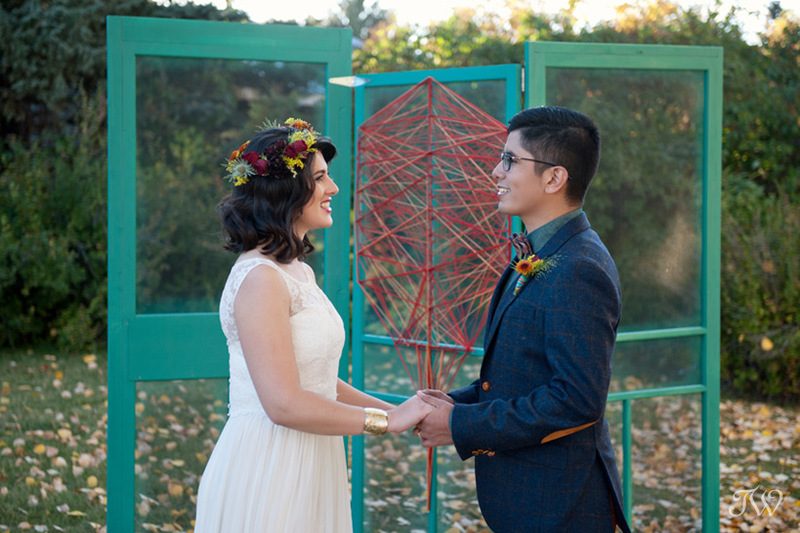 She wrapped the stems of the wedding bouquet and boutonnière in contrasting yarn from Stash. 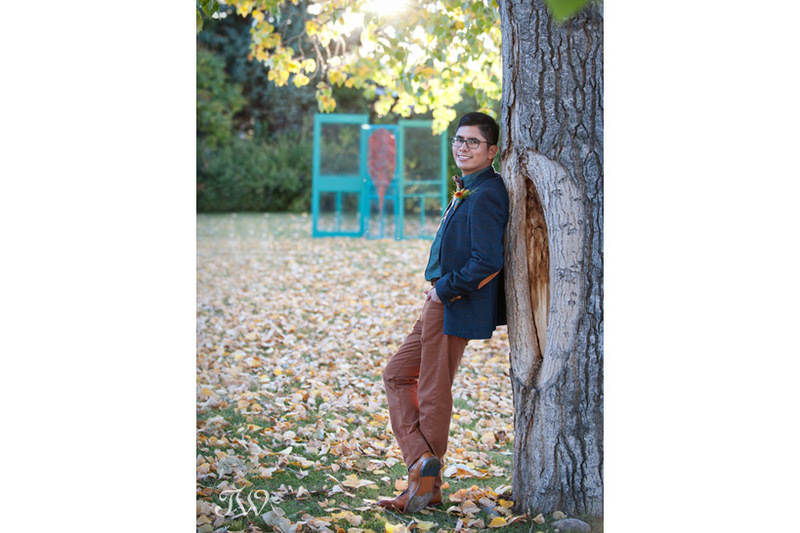 Ali from Modern Pulp created a whimsical program using a “string quote” from a well-known song. 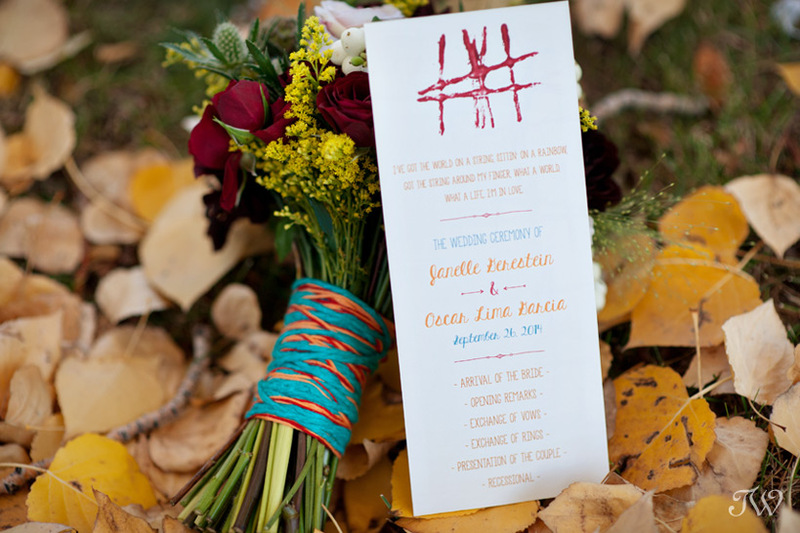 The ceremony programs were yarn-stamped using a wooden block, wrapped in coarse-textured yarn. What a world, what a life, I’m in love. 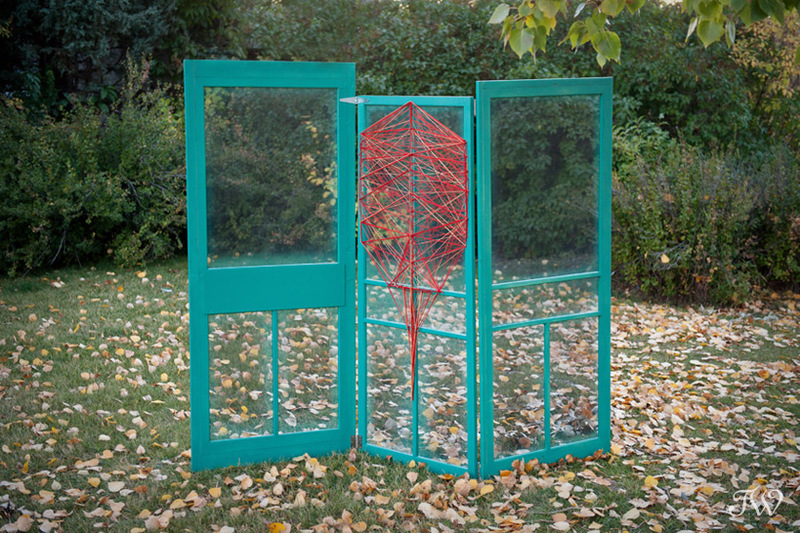 I had a screen door partition in deep turquoise and decided to create a stylized leaf using yarn from Stash. 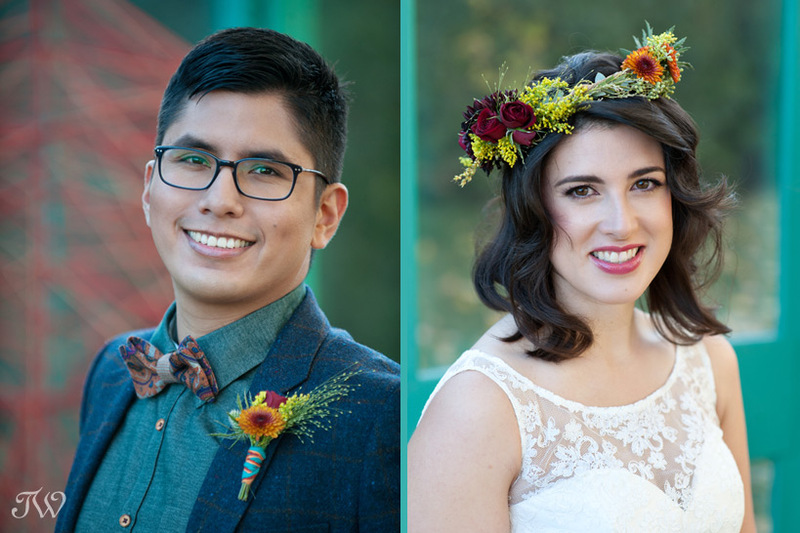 I love the pop of rich, fall colour on the wedding ceremony backdrop. 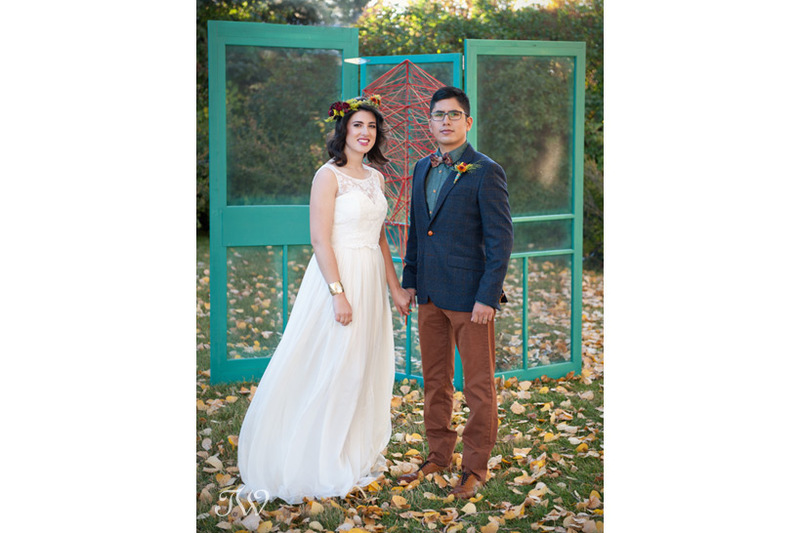 Our handsome groom Oscar, was outfitted head-to-toe by Ed Williams Menswear. 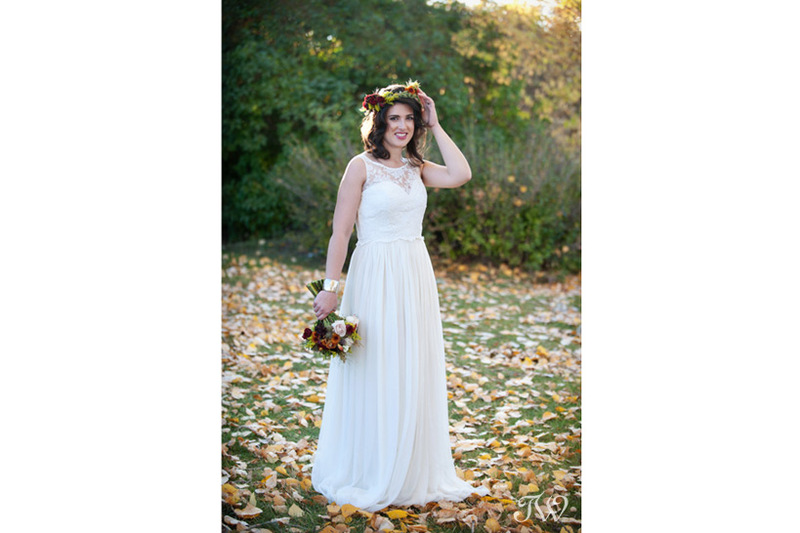 Janie made a beautiful bride in the Leanne Marshall’s Eloise gown and Clementine top from Frocks Modern. 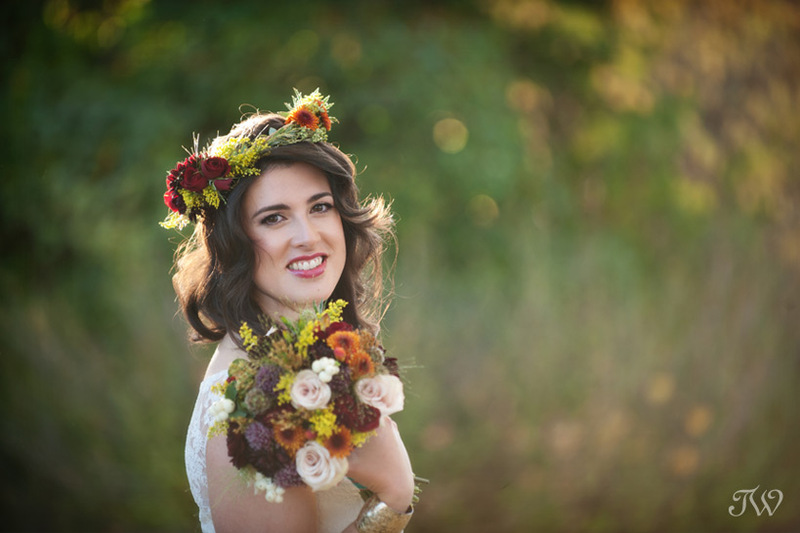 She crafted her flower crown using fall blooms and her hair and make-up were styled by Lyana Gibert of The Art of Beauty. Thanks to everyone who brought these ideas to life.